One of the hardest things to get my fourthies to do every year is learn how to read nonfiction text. I know they talk about it a lot in the k-3 classes, and I know all of our teachers do a great job! The kiddos just have a hard time wrapping their heads around all of those facts that don't make up a funny or crazy story. I decided to try something new this year. 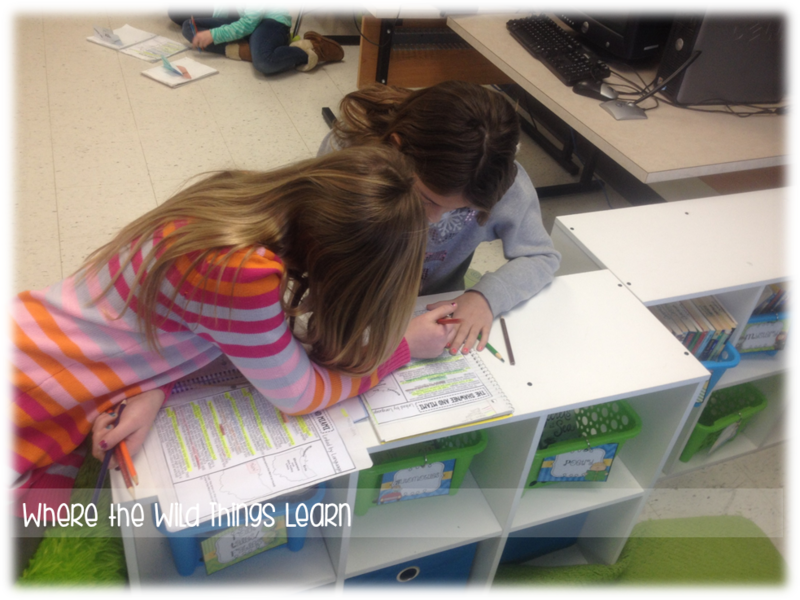 I taught nonfiction text feature and structure VERY early on, so we could practice our knowledge and skills throughout the year by integrating it in Social Studies. 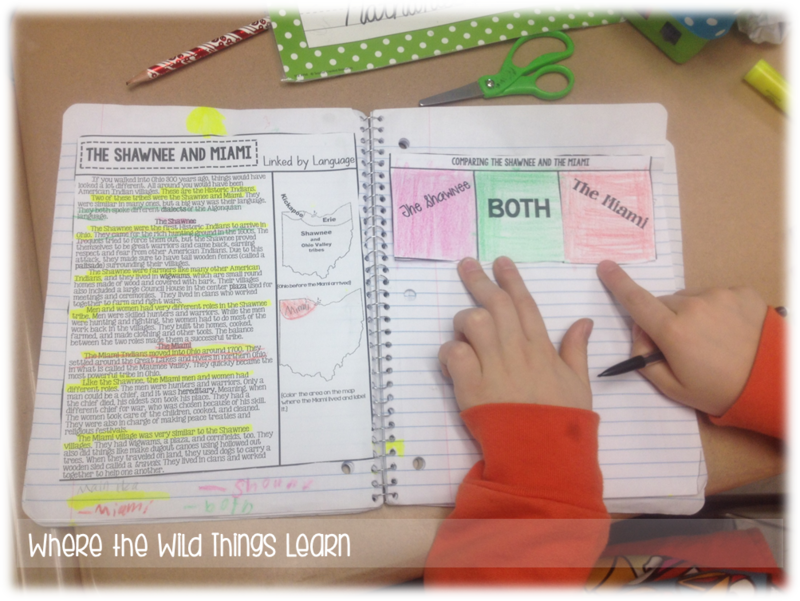 One of the best ways to encourage their understanding and teach them good reading skills is using color coded notes. It can be time consuming and hard, but it's so meaningful! Here's an example of what a normal color-coded note taking day looks like. 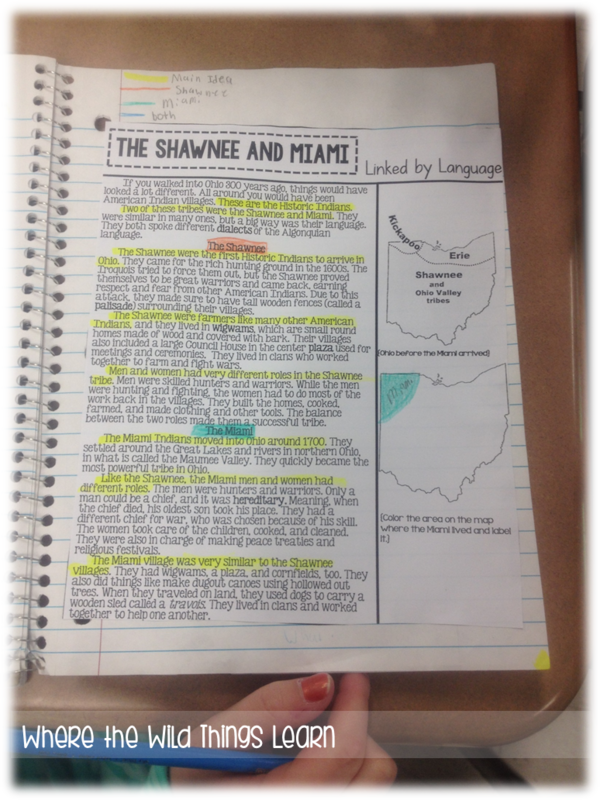 We were studying different American Indian groups in Ohio, so I gave them a short passage that I had compiled on the Shawnee and Miami Indians. I have them put glue around the edges and glue it down in their Social Studies spiral. Then, we make a key for our color coding. *When we first started this, I actually gave them a square piece of paper with "key" at the top and boxes for them to color in and label. They're pros at this now so I just let them make their own! 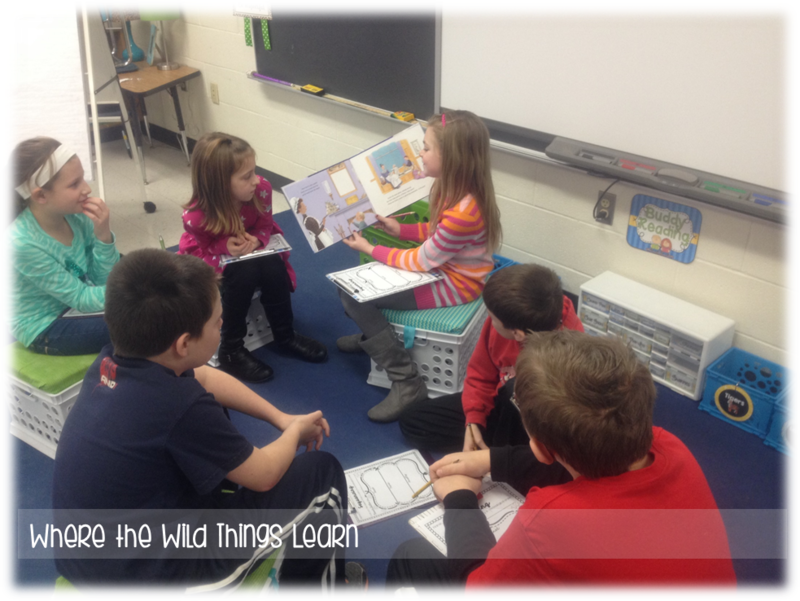 Then we start to read! As we read our first time through, we stop and highlight the main idea sentence for each paragraph and discuss supporting details. I usually do an example on the board with them to get them started if we're not doing the whole passage together. 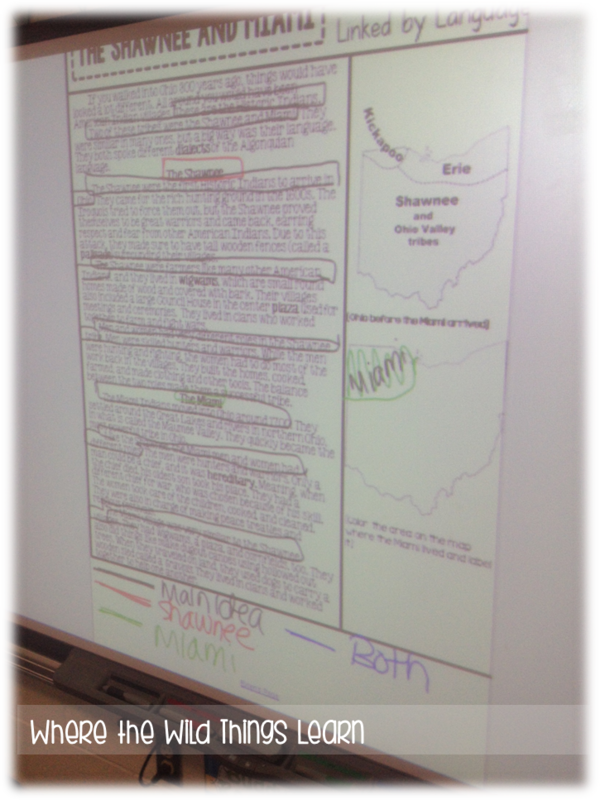 I didn't use the highlighting feature on my Smartboard, so I just boxed the main ideas. 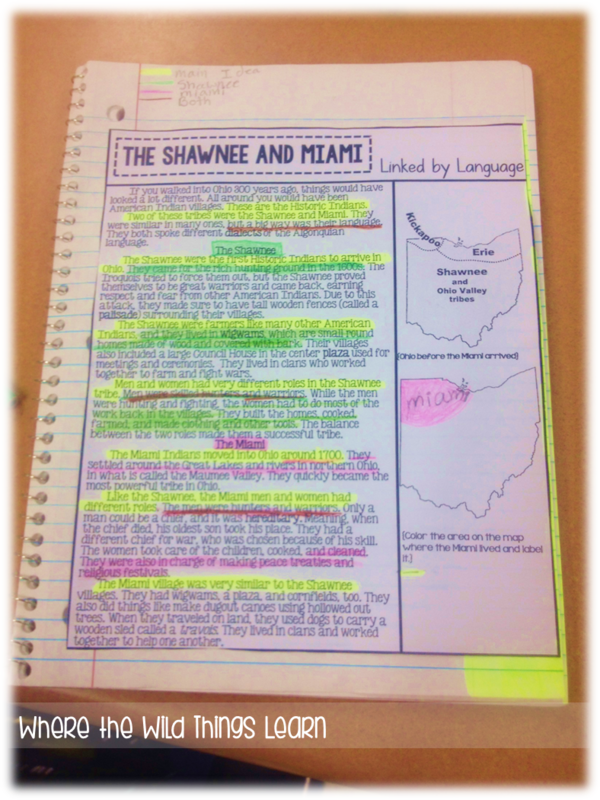 For this activity, we were reading about the Shawnee and Miami American Indians. So in our key we assigned a different color to each group, and a color for both. 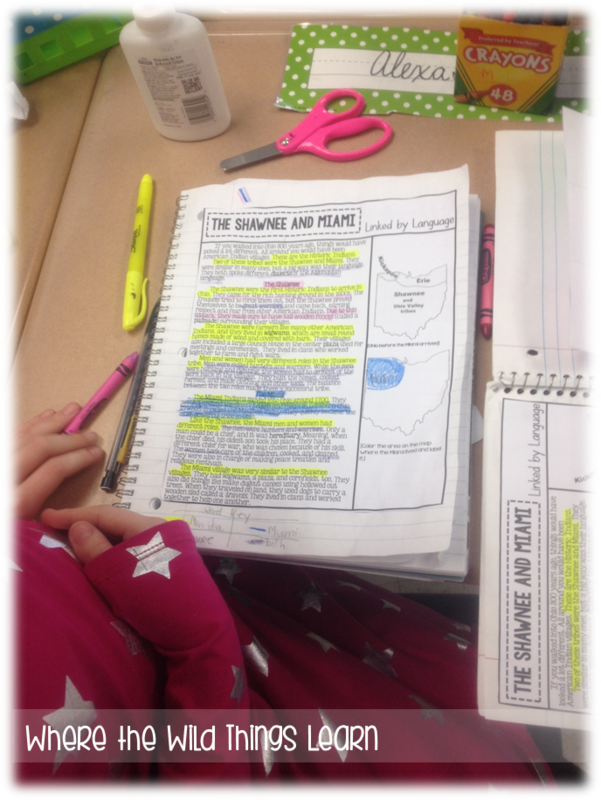 After we've read our first time through and highlighted the main ideas, we go back through and look for and underline whatever our skill focus is. 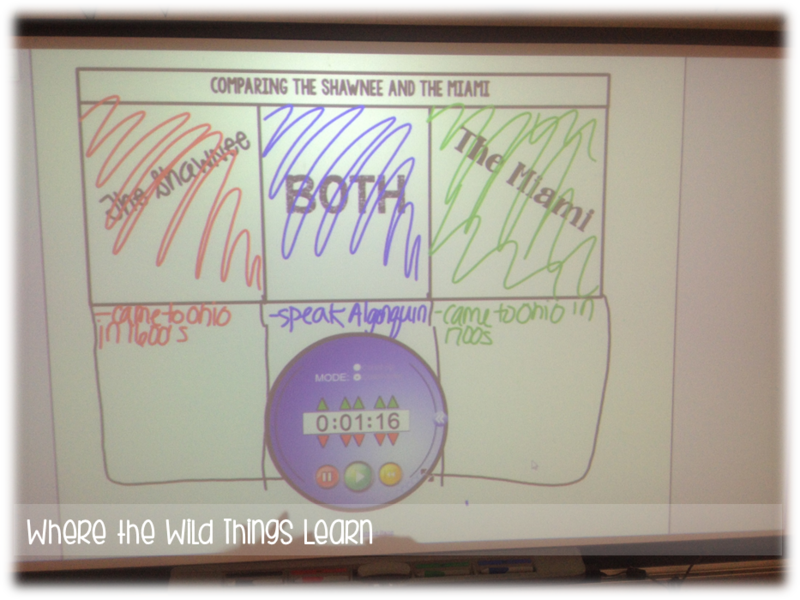 For this lesson, we were working on comparing and contrasting. 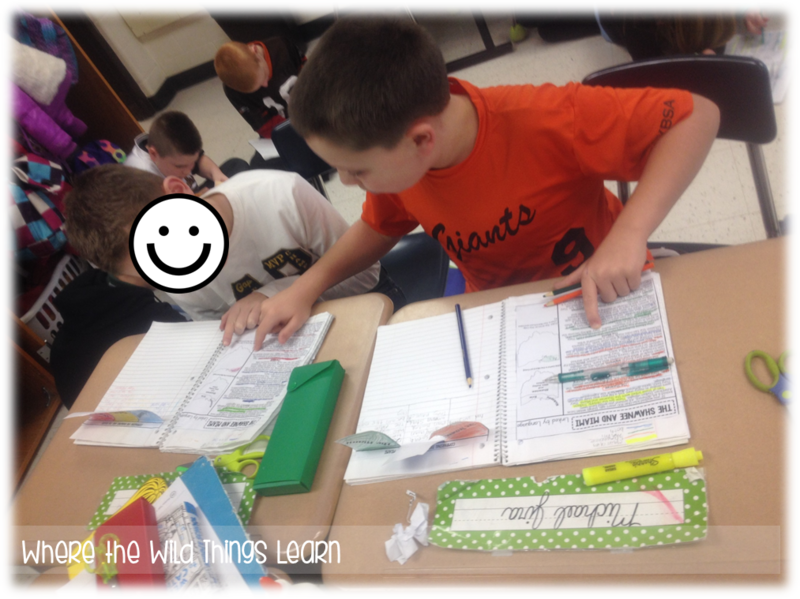 For this lesson, I had them use their color to shade in the group's name (you can see the orange and blue on the student's below) as a reminder what that tribe's color was. 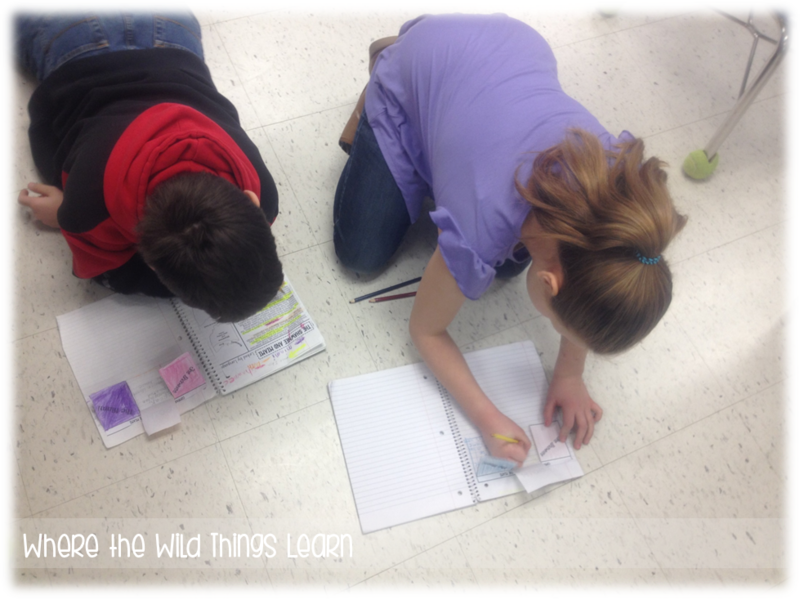 After this whole group portion, I also put them in pairs or groups to do a "wrap-up" interactive notebook activity to review and pull their notes together. For this, I gave them a 3 square comparison chart. 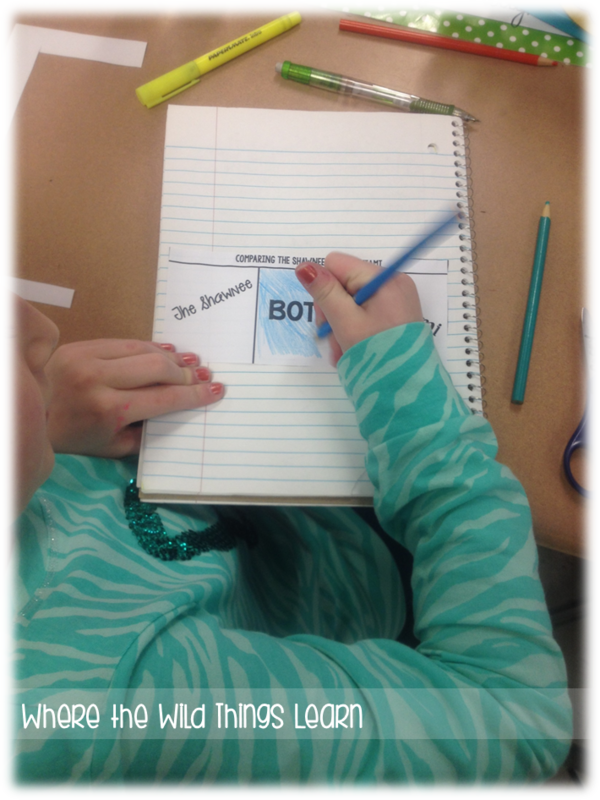 After cutting and gluing, we color coded these boxes to follow our key and notes, too! I also do one example of this on the board with them (it's usually a pretty rough sketch, but you get the idea.) Then I put a timer up and have them get into their groups to work. They love seeing all of the colors and proof of their work when they are done! And I LOVE how interactive it is, and how much they learn from it! Love this idea! Where did you get the article? Did you create it on your own or is it from the social studies textbook? I, too, teach social studies during the LA block. I made the article on my own! I am working on making them for all the topics we cover and will hopefully post them in the next month or so :) If you're just using it for your own classroom I'm sure you could copy one out of your textbook! Thanks for stopping by!